The decrepit wooden platform could have easily been mistaken for organized debris. My misinformed eyes were under the influence of heavenly names; Jade Mountain Summit, Dark Dragon Ridge, Cloud Dispersing Peak, and Landing Geese Mountain, had instilled an imaginary welcoming that was not here. My mind was a grindstone trying to etch sense into the barren landing that lacked any reference to Heavenly Stairs. Scorching heat misshaped boards that begged for shade but this, the Huashan train station, lacked any sort of reprieve. Standing in this barely identified location, reason called an immediate meeting with all my preceding China experiences. It was agreed that this was simply just more of the same. Unaffected, I determined the direction of town. Irregular stones twisted strong ankles encased in adventurous footwear on what could barely be described as a road. This is a typical day for me in this ancient, ambiguous culture and I am sharply prodded to resolve any separation from this fact. I remind myself that I am a participant, dusty sweat and all. The desolation of the planks called a train station had been accentuated by an altercation I witnessed. Two men had shot angry Chinese splattering a young woman who seemed to have wondered out of a Shanghai hotel tearoom. She was shrinking. I, blonde, blue-eyed and taller than both men, inserted myself between tiny girl and dirty men with bad teeth. No thought preceded my appearance as a galactic alien. I was far from any place where westerners were seen and now, apparently shocked by what they most have identified as super woman, the men were shrinking off on orangish-yellow, cowardly dirt. Hoping for a breeze, I think of a different windless day. It was my last day on our sailboat, now on the other side of the world from me. On that motionless water, I recall not caring because I was still immersed in the art of sailing. Here, in motionless air, I can revel in a similar love and I do. Much of what is beneficial for ourselves and others is inconvenient. The man who was first to summit Mt. Everest, Sir Edmund Hillary, said it best, “An adventure is only an inconvenience rightly considered.” Exploring wilderness unclean even in rain, lost in the Beijing maze of streets, offshore without wind, battling evil on an orange, alien terrain, or any other part of an experience-oriented life are an accepted part of my adventures. Everything in my life is normal. That must be understood. I have not traveled 12,000 miles to become an extraordinary person but a decade ago, I decided to accomplish my fullest life. I discovered and made a way to do it. I am here because on that last Caribbean day, this unplanned journey instantly replaced my original intention for green, Irish hillsides with something I had to do. I stopped alongside an ancient pile of unidentified dirt for no reason. I’m not wondering if I am lost and almost admit I would like to be. I hoped for the wind to at least momentarily brush my face. Instead, all I can do is sparingly splash Shaanxi province water on my toasted face and see the mirage I want to believe is my hotel. After a night on a thick mat defined by the weekly-only change of the sheets, back-tracking the now-friendly road produced east-facing mountain sides that projected the morning colors of the eastern sky. The dancing light took my mind off the filthy lodging where I had to choose either electricity or hot water but received neither. Awakening without daylight was easy most mornings. Today it was joyous. My direction was delivering the Heavenly Stairs and an arduous six hours upward to an ethereal bosom. I will be mountain hiking, not mountain climbing but I think of my favorite climbing rules and make them fit the day. Even to myself, I refuse to define why I have come to the Most Precipitous Mountain under Heaven. My intellect wants to romanticize a pilgrimage or perhaps label it as a quest but my spirit remains bland. Somehow, I know why the Chinese had christened it so. I will come off the mountain and into the remainder of my life knowing why I do this. As perspiration signals the day, I cannot possibly know how much Huashan (Flower Mountain) will change me. My efficient little camera and $130 pocket video recorder offer no clue for a future Telluride Film Festival event. Almost constantly immersed in myself while at the same time valuing the setting, I barely remembered to snap the shutter. Packets of drug store-printed photos offered no proof to friends at home. Hurried videos yielded convulsive snippets as dizzying as the narrow ascension. The Telluride Film Festival representative called me. Unknowingly, one of my friends was involved with the film festival. We all met. Daylight was screeching into my living room. My photos were scattered on the coffee table but were not much help to the annoyingly reflective tv scenes delivered from my cheap video camera in all their shakiness. I apologized for wasting their time. Their commentary could have been authored by me. I had been self-creating my life for many years and had not found anyone so far who shared my approach. I felt secure. As I am writing this article two decades after Huashan took me in. I am interested in the how the Most Holy of Chinese mountains is doing in 2018. Recent traveler reviews of Biang Biang Mian (noodles) and Red Bull in small golden cans greet my peek into the state-of-the-art modern Huashan setting. These are now sold along with other snacks exactly where I reinforced the naturalness of my experience – the lonely, ancient Taoist Temple I loved one misty morning on the south peak of Huashan. The ex-revered place of calm now offers a different, modern transformation which includes prices five times that of 7,000 feet below and selfie proof of a good time. New cable cars bring tourists to the top. Disney-replicated lines bring unwanted, sweaty unity to hundreds of sightseers replacing ancient Taoist wisdom with refreshing beverages and expensive snacks. I need a break (guess why) but I promise I will complete this by my self-imposed deadline. I’m writing again. Having come very close to ranting previously, I will now continue with an open awareness. It’s not dangerous; absolutely no one has died. These people are writing about a 13 foot walk on boards with solid handholds while wearing harnesses made for real mountain climbers. They wore their inflated emblem and left the truth of the ages uncovered. The Chinese are smart marketers. The harness cost $6.00 to rent and at the end, you can buy a swell photo from the guy in the booth. Riders die on American roller coaster rides and there is also a photo available at the end. As creative and effective as the Huashan marketing is, it’s too bad that most reports from tourists read like trips to the Grand Canyon or Disneyland. I’m sorry they missed the life enriching experience. Very sorry. If it serves their lives to have survived the world’s most dangerous hike so be it. What is dangerous to me is a world where antiquity and ancient wisdom are displaced with tricks of collecting sights like leaking bucket lists. This robs us of our own self-dignity regardless of how we interpret past cultures and their accomplishments. Self- respect and the love of our own traditions, culture, philosophies and religion dies with every act of ignorance and bias. I do not write of tourist failure to appreciate the Taoists; I mourn for the loss of reverence and respect of that which we do not understand. I experienced my stay on Huashan opening up to natural truth and losing myself. I carried no copy of the Tao Teh Ching or any intellectual baggage that could have substituted as the menu instead of the meal. 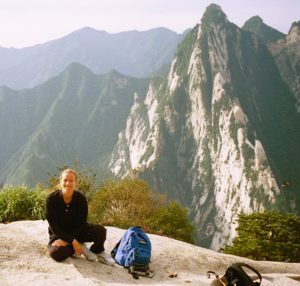 Two decades ago is a but a speck of time in Huashan’s antiquity but it allowed me to touch it along with no more than 20 other visitors within reach. Hawkers, ticket lines, and over-priced goods were but a gleam in the eye of those with that vision but the shadow had appeared. Virtuous practice starts with the heart. Intent is the source of the supreme within. I was standing very still as the Emperor’s chess pavilion on the eastern peak shined into me. I knew the interesting story of why it was built but It didn’t matter. 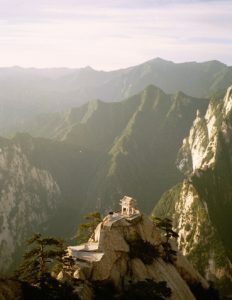 I came away from Huashan with ancient wisdom but knowing I had it all along. I have lived with many aspects of Huashan’s ancient sage, Chen Tuan, for the past 23 years. His writings remain relevant and my daily qi gong practice includes the very exercises he developed more than a thousand years ago. 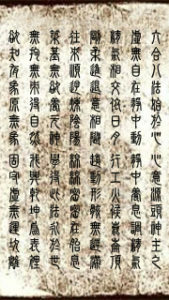 Few Chinese know them and this is the first time I have disclosed my personal cultivation in writing. There is nothing new of the world and humankind’s true nature is to express diverging values of yin and yang. This is called universal balance. Chen Tuan accentuates the positives of life in his writing which follows. He must have known mankind would continue to find his guidance nourishing and needed. Wow! What an enthralling and captivating piece of writing! What an amazing life experience to share with us. Your writing makes me go deeper and truly think about what holds true value – authentic experiences that touch our heart! I was transported by your account! As an avid mountain hiker … and someone who seeks to find authenticity in my life experiences … I am intrigued. I have just found this website–it is a destination filled with stories, insight and inspirations! A good friend just told me, “You can always start again.” What a wonderful destination to help ignite that process! I am excited to revisit and be stirred to possibilities … and perhaps find kindred spirits, as we each try to self-create our next chapter. Your story transported me! As an avid mountain hiker … seeker of authentic life experiences … I’m hooked! 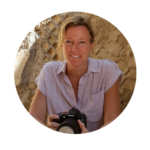 I have just discovered this website–a treasure of adventures, insights and inspirations! ! have just begun clicking around, exploring–and I look forward to returning to see more. I hope to grow and find kindred spirits as we each enjoy our own unique journey to a self-creating life! Thank you for this poignant reflection. Your enthralling story and its profound significance should be read by all. Your writing took me deep into your experience and I can still feel the adventure. You have managed to combine this with a useful commentary on modern (and ancient)) life., reverence and respect, and meaningful guidance from one millennium ago. My imagination is running wild with your remote China images and my life has been changed. Thank you Lana. I can’t wait to start reading Self Creating Life!